Book review: "The Devil Colony"
This review first appeared in Turbula in June 2011. A combination of "National Treasure," "The Librarian" and any number of characters from military thrillers, James Rollins' mythical black-ops Sigma Force is an interesting concept with some pretty cool potential. 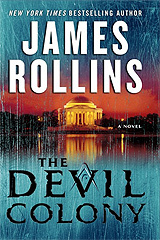 But in Rollins' latest Sigma Force novel, "The Devil Colony," the suspension of disbelief required of the reader becomes too great, the conflict with even a basic knowledge of science too jarring. The story revolves around discoveries that indicated President Thomas Jefferson had been negotiating with Indian leaders to form an all-native 14th colony, consisting of much of what is now the Western United States. Only it turns out that there were Caucasian tribes among those doing the negotiating. A huge burst of neutrinos in Utah following an explosion at a burial site with Caucasian Indian remains brings in the Sigma Force, as well as their even more shadowy criminal enterprise The Guild. This basic premise is pretty fun, and should work better than it does. The Sigma Force, a sort of special operations force of ex-military scientists and other brainiacs who work out of a secret basement beneath the Smithsonian, is a unique premise. And the question of why and how Lewis & Clark missed Yellowstone on their cross-country trek that Jefferson sent them on is one of those mysteries of history that lends itself to a grand tale, as does Meriwether Lewis' real-life mysterious death. But then we run into things like a new, special gold that is harder and melts higher than normal gold. Even a freshman-level chemistry or physics class will disabuse the reader of that possibility. Later it turns out that the Caucasian tribes whose burial sites keep coming up are a lost tribe of Israel. Except that only the most cursory knowledge of anthropology is required to know that the ancient Israelites were not Caucasian, but Middle Eastern. And don't even get into the physics of neutrinos, or the notion of ancient Israelites possessing nanotechnology, or ... well, let's just leave it at that. All of that is too bad, because the core story, as mentioned, is compelling, and could have been told without such basic distractions of plain silliness. Many of the characters are as strong as that core story: Painter Crowe, director of Sigma Force, is a prototypical lone-wolf military figure, but the former Guild operative, Seichan, could have come out of a classic spy thriller by Le Carre or Deighton. Rafael Saint Germaine, the shadowy representative of the Guild in this novel, is also intriguing, the sort of villain you'd fine in a vintage James Bond novel. For a fun, summer beach read, "The Devil Colony" is an entertaining couple of hours. The frustration to the reader is that the premise is so strong and the end result so diffused. The novel could have, should have, been so much better  on a par with a Tom Clancy novel. Instead, it's pretty much just a throwaway summer read.